The crossed scrolls motif seen on the costume of Otokonosuke is the Nakamura crest. This motif also appears on the robe of this actor in #355 in the Lyon Collection. The flying crane seen on the same garment is another Utaemon III identifier. Arajishi Otokonosuke (荒獅子男之助) is one of the most popular and iconic figures of the kabuki stage and hence the world of ukiyo prints. He is one of the most memorable figures from the play Meiboku Sendai Hagi or 'The Disputed Succession'. "...has taken up a post below the floor of the boy's room. He is waiting there on the alert when he sees a large grey rat coming down through the floor carrying a roll of paper in its mouth. Otokonosuke puts his foot on the rat and tries to kill it with his iron fan. He wounds the beast on the head, but it wriggles away from him and escapes. The rat vanishes in a cloud of white smoke and in its place is revealed Nikki Danjo, who has occult powers, clad in grey garments and with the document between his teeth. He has a fresh wound on his brow. He traces the character for 'rat' in the air with his finger. Otokonosuke is powerless against him. Danjo goes off triumphantly having achieved his object of possession of the list of conspirators." Hagi wa Sendai Matsumoto appears to be a reworking of the well-known Meiboku sendai hagi, a play dramatizing the intrigues over the succession within the Date clan of Sendai during the third quarter of the seventeenth century. Meiboku is a classic play, so popular that during the Edo period it had at least one performance nearly every year after its premiere in 1777, and it spawned a number of adaptations, as in the Hagi wa production at the Naka in 1821. In the play, Nikki Danjō conspires to overthrow Ashikaga (a theatrical substitute for the Date clan name) Yorikane, but he is foiled in the end and slain. The ghostly rodent is actually Nikki in metamorphosis — he possesses magical powers, including the ability to turn himself into a giant rat. Nikki holds his hands in the manner associated with nercromancy as the rat emerges from his human form (note the lighter shading of the tail and hindquarters, indicating that the transformation is still in progress). Nikki is a prime example of an important role type known as jitsuaku (or tategataki) — unrepentant evil samurai who plot to overthrow their lords. They are also referred to as kuni kuzushi ("demolisher of nations") to signify their intention to usurp an emperor's throne or a daimyō's domain. The rat holds a scroll containing a list of conspirators planning to wrest power from Yorikane. Later, pretending to have reformed, Nikki will substitute another list and offer it as trumped-up evidence of the conspiracy, only to remove a dagger hidden within the scroll and mortally wound a counsel and ally of Yorikane's son. 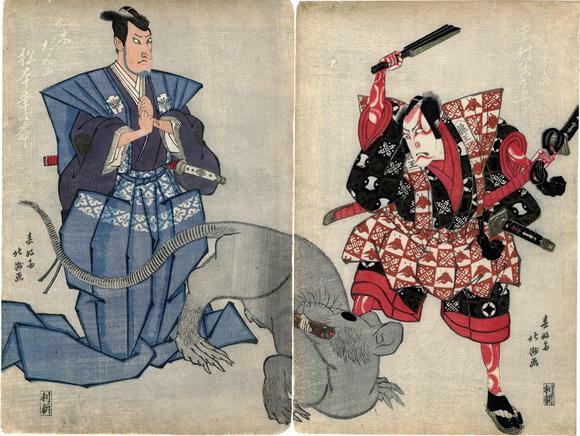 There are at least three other prints in the Lyon Collection with Otokonosuke in them: #833 by Kuniyoshi; #779 by Toshihide; and #894 by Kunisada. Nikki Danjō is one of the great villains of kabuki theater. He is also a great sorcerer. This is described well in Earle Ernst in his book Kabuki Theater, p. 100. "A somewhat curious exit outside the curtain is that of the evil magician Nikko Danjō in The Famous Tree at Sendai. The warrior Arajishi has seized a large rat which carries in its mouth a scroll containing the names of a group of conspirators among which is Nikki Danjō. After a struggle, the rat escapes from Arajishi, runs to the hanamichi, and disappears into the trap-door at the shichi-san (the trap called the suppon) in a cloud of smoke. Immediately after, Nikki Danjō, transformed from a rat into a human being, dressed in mouse-colored clothes, and holding the scroll in his mouth, slowly ascends on a trap-lift. Arajishi defies him from the stage in a mie, and the curtain closes. Nikki Danjō makes a series of mystical passes with his hands and then turns toward the agemaku. He has given himself the mystic power to walk on smoke, and his extremely slow, quiet exit conveys the impression of this rare form of locomotion." Illustrated in Ikeda Bunko, Kamigata yakusha-e shūsei (Collected Kamigata Actor Prints) Volume 1, Ikeda Bunko Library, Osaka 1997, no. 100.